Ho! Ho! Ho! and a Happy December, everyone! 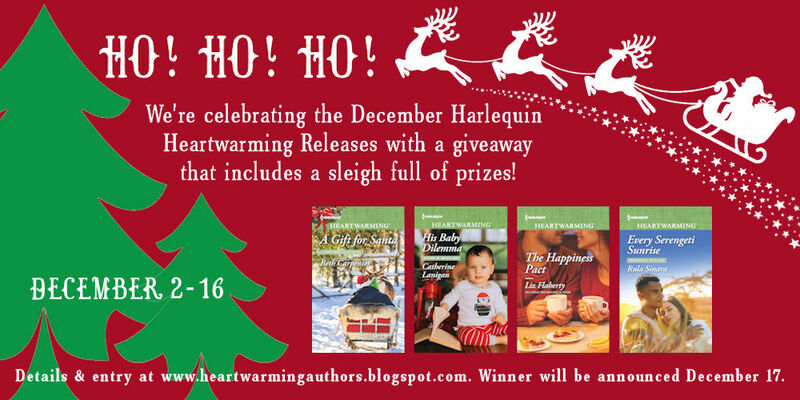 The December Harlequin Heartwarming authors are celebrating their book releases with a huge holiday giveaway right here on the Heartwarming Authors blog. When we say ‘huge’, we mean a Santa’s sleigh full of prizes for one lucky winner! We told you the winner would get a Santa's sleigh full of gifts! Don't need all those prizes or books? Use them as stocking stuffers or to help with your gift shopping if you win! Don't forget that books make great holiday gifts!!! Their shape makes them easy to wrap, they come in every genre and subject matter possible and reading is good for the soul, so giving books is an act of love. Stories...especially love stories/romances...are a way to touch hearts. 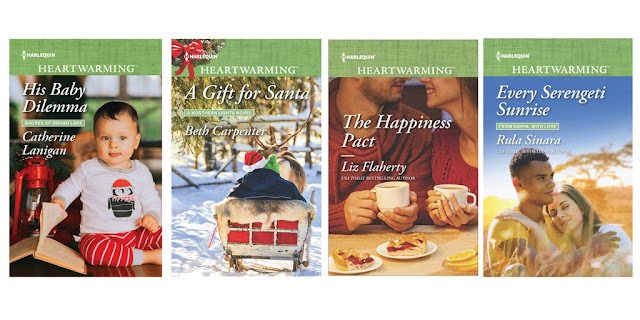 And if you know someone who loves to read romance, the Harlequin Heartwarming line is perfect for all ages (well, at least teens and up) and are the types of stories that can be shared between members of a family. 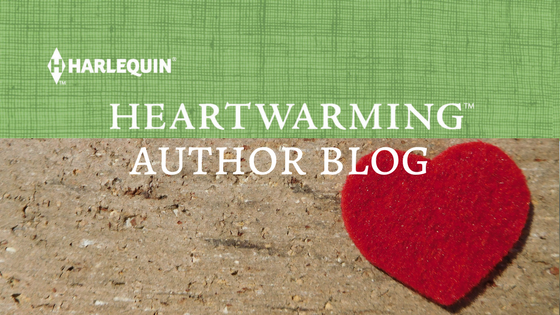 In fact, the December Harlequin Heartwarmings released yesterday (Dec 1st) in ebook format!!! Print copies will release on Tuesday (Dec 5th), so you can go ahead and order your copies now! Merry Christmas! Thank you for this awesome giveaway. I love all of your books. Thanks, Penny and Merry Christmas!! Well, it's Christmas and I have a problem with friends and readers...I believe I just may BE Santa Claus or at least an Elf helper person...so the Heartwarming Sisters are proving to be a very generous group, yes? But it's Christmastime, and everything is magical. Good luck! I have to agree! Christmas magic and elves at play! Great prizes and fantastic books...thanks, ladies! We are having so much fun--we hope you're enjoying it, too! You're so welcome! Good luck! Hmm....I got caught in a strange loop. Thank you for the opportunity. I'm sorry it gave you trouble! I'm not sure what happened but I'll look into it. Do you perhaps already follow us on Twitter? If so, maybe the Gleam set-up could tell? I'm just guessing. If anyone else has trouble with Twitter, please let me know. I'll check the links. Alexia, I'm not sure what happened. I just tested the links as someone entering (obviously I'll remove my name, as I don't qualify lol) and if I clicked to follow it asked me to log in to Twitter to do so, which makes sense. And it also has an 'Already following?' at the bottom. When I clicked that and put my Twitter handle, it gave me an entry. If anyone else has issues with this, let me know. Sorry for the issue, Alexia! Whew! Thanks, Rula for checking on that for us! And good luck, Alexia!!! Good luck, Alexia. Sorry it's giving you trouble. Thanks for this great giveaway..
You're welcome, Donna. Glad you're here. Good luck. Merry Christmas ! Thanks for this opportunity to enter. Merry Christmas to you. Thanks for coming to our celebration! Merry Christmas, Eliza. Good luck! I love that you love it!!! So glad you like it, Julie. Good luck! You're welcome and good luck in the drawing! Thanks for joining the fun and entering, everyone!! It's a fun way to start the weekend and holidays :). Another wonderful giveaway from all of you!!! Hope everyone enjoys the holiday season and has a Merry Christmas. We're pretty sure we will --we hope all our friends and readers do, too. Thanks, Darlene and good luck! I still love, love that photo of you winning my basket back in the spring. THAT was a really happy face!!! Big hug and good luck. You ladies just keep on keeping on with fantastic give-aways. Those books are all so worth buying and giving as gifts. Thank you so much, Roz! We started working on this back at RWA! I bought the latte mugs in Scottsdale when I was there! WHOA! Merry Christmas! Oh WOW! What an awesome giveaway. Good luck! Thanks for joining us. THanks, Marcie! Merry Christmas and good luck!!! Keep following us and you never know what other surprises just might pop up! Hey Marcie! Glad you like! Happy Holidays!! What great giveaways! Thank you for the opportunity! Thanks for entering, Melanie. Good luck! You're so welcome! Best of luck in the drawing! What a great giveaway! I hope to win, but good luck to everyone. Thanks for the giveaway. So glad you entered. Merry Christmas, Debbie. You're welcome. Merry Christmas, Penney. Great sleighful of books and bounty! Congratulations to all the authors! Aw, thank you. Merry Christmas. 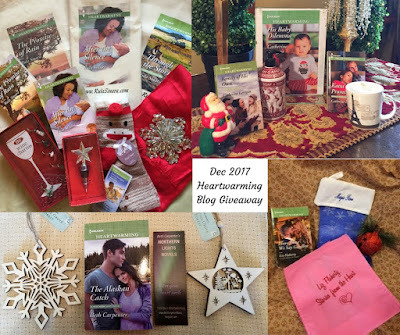 Awesome giveaway from awesome authors! Thanks for the chance. Merry Christmas! Wow!! Awesome & generous prize pack!! Merry Christmas Y'all!! We had fun putting it together :). Good luck in the drawing! Hi, Robin! Good luck! Merry Christmas! Oh, what an AMAZING giveaway!!! You all are such GREAT Christmas elves!! Lol. But seriously, these books all sound exactly the way this series is titled -- heartwarming, and I'm really looking forward to reading them all! P.S. I've added this blog to Bloglovin', and am following it there! Thanks, Maria! We love being Heartwarming Elves ;). We hope you love them as much as we love writing them. Thank you, Lynn! Ditto what Liz said. Enjoy! Thank you for such an amazing and generous giveaway chance. Trying to remember if I've been good enough. :) Truth be told at my age there isn't too much bad I can do. lol Happy, Happy Holidays everyone & good luck to everyone. Oh, we can ALways find some bad to do if we look hard enough. :-) Merry Christmas, Carol! Thank you for offering this fantastic giveaway. I've been reading Christmas-y books for a couple of months now. Merry Christmas! Reading them puts you "in the mood," doesn't it? Merry Christmas, Susie! To you, too! Thanks for coming by. We do, too--both the writing and the reading! Thank you for entering. Liz is right! We may write it, but we all love reading it too! Thanks for enjoying the line and good luck in the drawing! Thanks so much for the chance! Awesome giveaway!! this is full of such fun goodies! love it! Glad you like it! We had to resist keeping it all to ourselves lol ;). Happy Holidays! Wow! Thank you ladies and Merry Christmas!!!!! Merry Christmas, Jennifer! Good luck! Thanks for the terrific giveaway and Happy Holidays. You're welcome, Karen! Happy Holidays!! Huge congrats to Richard and many thanks to all who entered! We wish you all the very best this holiday season and through 2018!